hotel.info allows business and private customers to book hotels of all categories throughout the world at preferred rates. The free and straightforward service is available at hotel.info or via the company’s own multilingual 24-hour call centre. Visit VoucherGurus.co.uk to learn about savings and discounts available for hotel.info. Be well this New Year with a wellness package from Hotel.info, now starting from just 49.00 EUR/Night. Hotel.info wants you to act like the royalty you are! 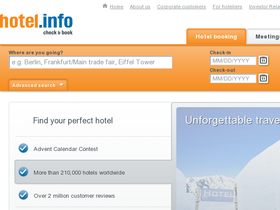 Find luxury 5-star hotels for as low as 88.00 EUR/Night. She sells sea shells by the sea shore...so why don't you join her there? You can relax by the sea for as low as 30.00 EUR/ Night with Hotel.info.